Measuring Instrument for Determining Height of Ears. 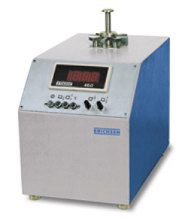 For rapid measurement of ears formed on cylindrical cups of diameters from 15 to 50 mm. The heights of the ears and valleys are measured and are displayed as a percentage and in millimeters by simple placing of the cup on the location of the instrument. The measuring resultis displayed on digital display when a push-button is operated.